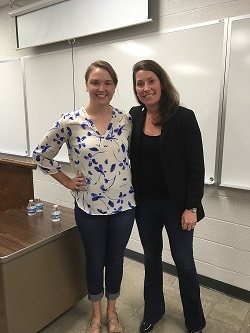 "Secretary of State Allison Grimes visited WKU on September 13, 2017 to speak on the importance of the constitutional right to vote. Secretary Grimes spoke about the importance of registering to vote and then actually voting as a way to shape public policy and to have a voice in decisions made. Secretary Grimes told the students about her experiences as a candidate for public office and encouraged them to become politically engaged. The students paid careful attention to the fact that the Secretary referred to herself as a "public servant" not as a "politician". Comments from the students included statements that they felt inspired." Pictured is The Secretary with International Affairs major Maggie Sullivan.